The Sydney Rail Strike – why the Fair Work Commission had no choice. 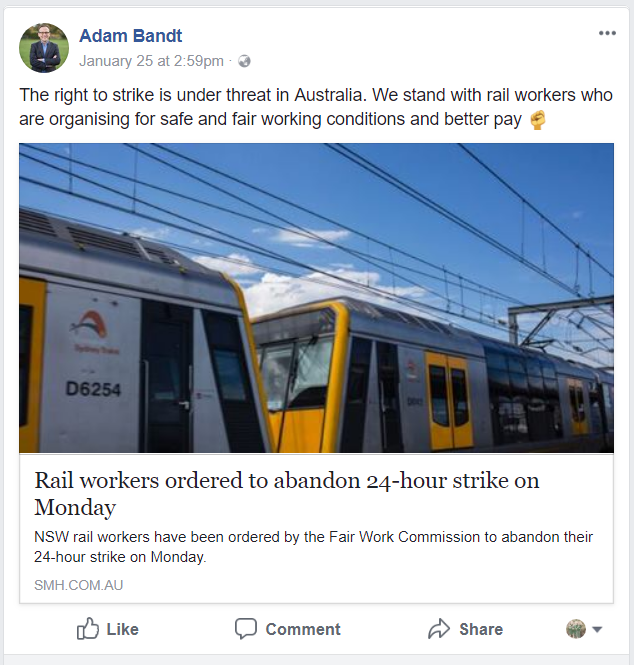 As an industrial lawyer, it was probably a mistake logging onto social media on Thursday, in the aftermath of the Fair Work Commission’s order in relation to the RTBU strike proposed on the Sydney rail network. Social media in the modern political era is rarely a place for nuanced, informed or intelligent discussion. Rather, it has become a place where people from both sides of politics (there are only two sides by the way) do little more than ‘like’, ‘share’ and ‘comment’ on pieces of web content that conform with their side’s view, and to dismiss (or troll) anything that doesn’t. Overall, the message of the commentary seemed to be that the prevention of the strike was yet another example of the ‘dystopian capitalist roll-back’ currently gripping the societies of the western world. In particular, it appeared as a regular view on Facebook that the legislative power to prevent this industrial action was new, or somehow recently introduced by government. This is plainly wrong, and deserves correction. It is with some irony that these industrial events centred around the Australia Day weekend. In my view, industrial relations is perhaps the one area of Australian politics of which we can be very proud. By international standards, Australia has always committed to and maintained a genuine balance. From the very early years of Australian political history, we have attempted to craft a system with appropriate harmony and tension between employer and employee interests. Consistent with Aussie informality, we call this ‘a fair go all round‘. Most notably, the Concilation and Arbitration Act 1904 (Cth), was one of our very earliest, and most important, Commonwealth enactments. Over the subsequent century, maintaining this balance between the employer and employee relationship has been a key part of our legal and political discourse. Three of our most famous and important High Court Cases concerning the scope of Commonwealth power: the Engineers Case, the Boilermakers Case, and the Work Choices Case, have each originated as disputes over employment agreement making. The Coalition have only made one concerted attempt in the modern era to reform industrial relations in a manner which genuinely undermined the power of employees. This effort, in 2005, was the primary cause of the immediate demise of the most dominant Coalition government in modern history, following an ALP landslide in 2007. The modern Coalition, who seem unashamed to deny climate change, lock up infant refugees, and do everything in their power to block marriage equality, have spent over five years in office hedging around industrial relations like it is a poisoned chalice. It is therefore safe to say, that the value of the employment relationship sits at the very heart of our political and social consciousness. In the United States, liberals often cite the Australian system as a positive example of how substantial employee minimum wage and entitlement provisions can coexist with sustained economic growth. On the other hand, countries such as Greece have demonstrate that uncontained freedom and exercise of industrial action can have broadly detrimental consequences to economic and social well-being. To this end, both ‘sides’ of politics should remember that we have always (at least in this one area of law) achieved a relatively healthy political compromise. It is not often that I go out on a limb to defend the Commonwealth executive. But on this occasion, I am happy to be the first to opine that there was nothing controversial about Thursday’s order by the Commission. And nothing about it was inconsistent with the similar orders made in the late 1990s or early 2000s, under the equivalent provisions of the Workplace Relations Act 1996 (Cth). Further, I acknowledge that the Fair Work Commission members are political appointments, and Deputy President Hamberger was appointed to the Commission by a Coalition government, and has an industry, rather than union, background. However, I believe that the decision was non-partisan, and that any one of the many Commissioners or Deputy Presidents appointed from union backgrounds by Bill Shorten during the Rudd / Gillard government would have come to the same or similar result. The reason for this, is that the rationale for making the order is premised on very narrow grounds, contained in section 424 of the Fair Work Act 2009 (Cth). This has been feature of Act for a decade, and the various predecessor legislative instruments for generations. Industrial action has never been ‘protected’ under Australian Law when it has the capacity to ‘threaten the welfare of part of the population’, or to cause ‘significant damage to the Australian economy or an important part of it’. The Deputy President held that the strike would threaten welfare of part of the population, recognising the number of people that rely upon the trains to go about their daily business, and making specific reference to the already congested conditions of Sydney roads, which are dangerous as they are, without thousands of additional cars, busses, and pedestrians. However, the Deputy President also held that the strike would significantly damage the economy of Sydney. To understand the meaning and importance of this provision, we need to look a little more deeply at the concept of ‘the economy.’ In the politically polarised world of ‘like’ and ‘share’ social media, ‘the economy’ is generally a code word for interests of the established rich, in particular the interest of ‘getting richer’. In the context of an ever-widening equality gap, this often equates to the poor getting poorer. The ‘economy’ is too often used by the political right in the ‘Republican / Trump / trickle down’ sense of the word, to scaremonger and justify cruelty or lack of attention to the underprivileged. When striving for social justice therefore, it is very easy, and often justified, to disregard ‘the economy’ as an irrelevant consideration. ……… 4. the management, or science of management, of the resources of a community, etc., with a view to productiveness and avoidance of waste: (national economy). 5. the disposition or regulation of the parts or functions of any organic whole; an organised system or method…..
To this end, the ‘economy’ is not merely the interests of the political right, or of those that own the ‘means of production’. It is all of us. Our economy is the sum total of our collective financial interests. This necessarily includes, and is sometimes little more than a collective appreciation for our individual financial interests. The New South Wales Government, may not stand to lose that much from a 24-hour strike, but many people in Sydney do. To see an example of the potential economic effects of the Sydney rail industrial action, I had to go no further than my office’s local station, at St Leonards. On Thursday, during the reduced timetable due to a union overtime ban, the food court was already deserted at lunch time. Most of these businesses are run by self-employed, small operators, paying high rents. The casual employees had been sent home, and the businesses were operating on skeleton staff. These self-employed operators, and their casual employees were out one day’s pay, in a week when they had already lost one day’s pay to the public holiday. If the strike had gone ahead, this would have been three consecutive business days’ pay. The knock-on effects are obvious. For some of these employees, this could be the rent that is due next week, food for their families, or the difference between buying their kids’ new school shoes in time for the start of term. Or, perhaps trivial to some, it would mean merely missing out on the few, well deserved, beers they had planned to have on the Australia day weekend. Further up the chain, this equates to less revenue for the grocery store, the shoe store, and the pub. In many ways, it would be useful to adopt Lord Atkin’s famous ‘neighbour’ principle when we discuss the term ‘economy’, rather than seeing it as only applying to the interests of the powerful or wealthy companies and individuals that appear to control the economy. When we do so, it takes on a different complexion. While the members of the RTBU may wish to forego a day’s pay to secure a 6% rather than 2.7% increase, I don’t see why the casual employees at the St Leonards food outlets, nor the self-employed operators, should do so, either voluntarily or otherwise. And these are only the first level ‘economic effects’ that are visible and obvious, before moving beyond one railway station. When magnified to the entire network, and city, the exponential knock-on effects are obvious. When we assess the broader potential losses to those people relying on the rail network, or those relying on the roads, to make their income, or even just the loss of productivity to those business requiring their employees to attend work, the impact was potentially enormous. Clearly, this proposed strike was never about workers exercising leverage over an employer, it was about workers exercising leverage over an entire community, including other workers, many of whom have no security of income. John Classen, on behalf of the RBTU, issued a media statement on Thursday prior to the order encouraging employers to ‘give their employees a day off on Monday’. While to your average full-time office worker, the idea of extending the holiday weekend seems like a pretty neat idea in principle, the costs of this on the economy (in the ‘neighbour’ sense of the word) would be astronomical. If this this is the union’s genuine position on how the strike should have been handled by Sydney employers, it is very hard for the union to then argue that they were not cognisant of the effects of their proposed industrial action on the wider economy. This is the type of leverage expressly prohibited by the Fair Work Act 2009 (Cth), and there is nothing new about this. While the very existence of industrial action depends upon economic leverage, a just and balanced society needs mechanisms to determine what leverage is fair to the affected parties who are not involved directly in the specific employment relationship. While workers are entitled to cause or to threaten to cause some economic harm to their employer to forward their own interests (as shown in cases such as BHP Coal Pty Ltd v CFMEU  AIRC, 17 April 2001), we should stop short of allowing unions to leverage wider economic harm against their members’ own employment interests.